You’ve come home from a long day at work and you have no clue what to make for dinner. You’re too tired to cook and everyone is hungry, what to do? 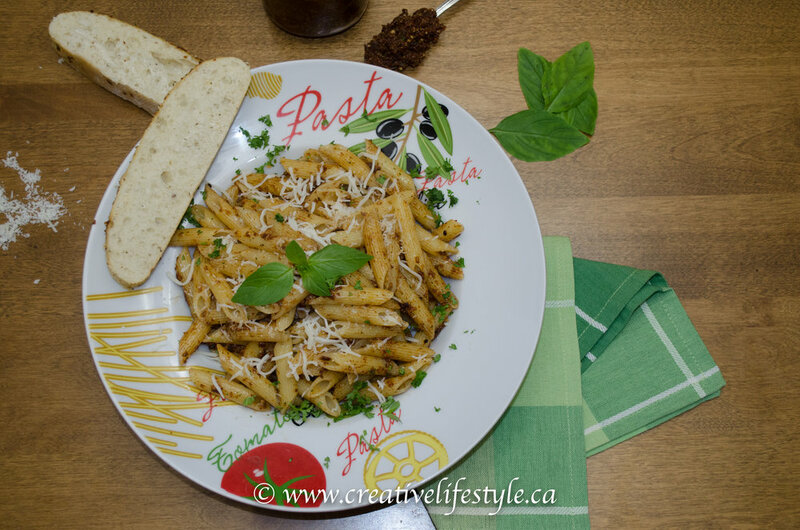 Everyone loves pasta, it’s a quick, easy and filling meal! Our Sun Dried Tomato Pesto Sauce whips together in just a few minutes or you can make it ahead for times like this when you’re strapped for a meal but don’t have the time or energy to fuss! Dinner is ready as quickly as it takes the time to boil water and cook the pasta according to the directions on the package; so 10 or 15 minutes tops! Our recipe is based on 1 pound package of pasta and we use Penne Rigate; it’s the one with the lines on it. Those wonderful little lines on the pasta help the sauce stick to the pasta! We’ve served up our with our Focaccia bread, add a garden salad and a glass of your favourite wine and dinner is done! In almost all of our recipes we do use Parmesan Reggiano Cheese; why you ask? It’s imported from Italy and has a more rounded full flavour; nutty and fruity taste enhancing all our dishes. It does cost considerably more but well worth the price and a little goes along way! We purchase it in large wedges and grate it at home but first letting it dry out a bit. You can though use any type of Parmesan cheese that you like in our recipe. A quick, easy and delicious pasta dish that will have them begging for more. Part I ~ Sun Dried Tomato Pesto:Combine all ingredients into a blender and blend until smooth. Add salt and pepper at the end to taste; the jarred sun dried tomatoes are slightly seasoned so adding salt and pepper at the end will insure you’re not over seasoning. Stream the olive oil into the top of the chute until you reach the perfect consistency for your needs.Part II ~ Cook the pasta according to the directions on the package.Once the pasta is cooked to your liking; we like it al dente (which is slightly undercooked). Drain about 90 to 95% of the water from the pasta; you want to reserve a bit of the pasta water to help just to moisten all the ingredients. Toss is in the Sun Dried Tomato Pesto, Parmesan Reggiano Cheese, parsley and olive oil to your liking; you don’t want your pasta swimming in olive oil just enough to coat all the noodles well. Top with more Parmesan Reggiano Cheese – bon appetite!